The back country of Alberta, Canada was the location that these five hunters posed for this picture  each had bagged a moose. I picked this picture up at an auction sale in Dauphin, Manitoba. 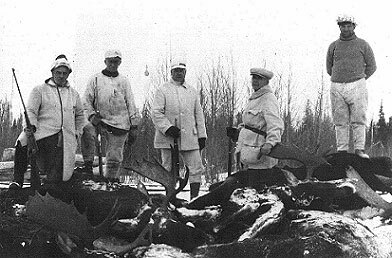 I don't know anything about the men in the picture or the details of this obviously successful moose hunt, except that 1931 was written on the back of the photo. I like to think that this group of hunters enjoyed moose hunting as much as I've grown to over the last 10 years or so. There is some good moose hunting in most parts of Canada, and although moose hunting means work when an animal is down, I think it's well worth the effort! As they say, "There's no such thing as a small moose!"